Description: this smaller species of Ceratopsian sports the typical four legged body with huge horned and plated head. The animal has a body resembling that of a rhinoceros: a heavy, muscled body and a short tail, walking on all fours. Its very large head ends in a huge plate (hence the code name ‘plate face’), though unlike his famous cousin Triceratops this dinosaur’s plate doesn’t have a round quality to it, but feels more square, adorned with horned protrusions along the edge of the plate and three rows of knobs running down it on the front side. The creature has a large parrot like beak, with one small horn on the nose and two more above its small eyes. Additionally, a smaller horn is found on each cheek. Its plate ends in a pair of horns on each side. The creature stands in an almost neutral pose, except for the tail which is bent somewhat to the left, and its right front leg being raised slightly upwards as if taking a step. This sculpt doesn’t sport an elaborate paint job. It’s mostly beige, including its legs and most of the head. Its throat, belly and lower part of the tail are coloured brownish orange, while its back and upper part of the tail, as well as the middle part of the head and the knobs on the plate are painted black. Its claws, five on the front feet and four on its hind feet are white, as are the horns on the head and the top horns of the plate (though strangely enough not the knobs on the sides of the plate). A black JP: Site B logo can be found on its upper left hind leg, with the number .21 next to it. 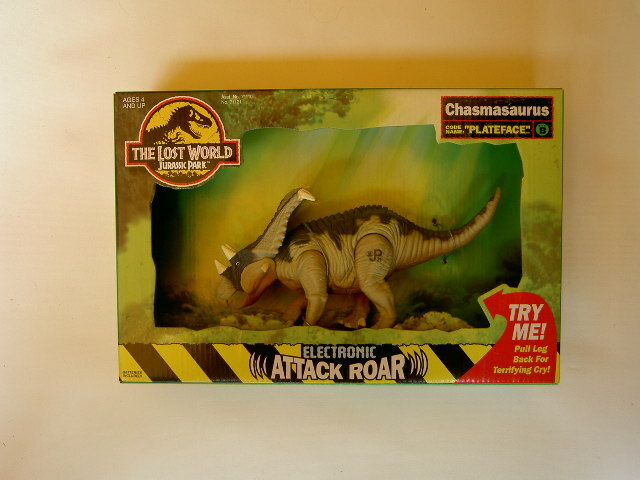 This animal is electronic and has a dino attack action with accompanying sounds. Pulling the left hind leg backwards makes the head move upwards, as if striking a blow with it. This also causes mooing sounds to be heard, similar to the sounds of cows, as if the Chasmosaurus is warning its herd of danger. Analysis: unlike with the two JP toy lines, which featured hardly known creatures alongside the usual range of Rexes and Raptors, Kenner proved less daring with unfamiliar dinosaurs or dinosaurs not featured in the movies when it came to the TLWS1 line. This Chasmosaurus is one of the few exceptions and a welcome relief from well known species. Though it’s not very dissimilar from Triceratops, its different head clearly sets it apart. Its plate is even more bizarre than the Trike’s, though it has smaller horns. Though the sculpt is quite original, its action feature is not. In fact, it’s the exact same feature as the small Triceratops from this toy line sports: pull leg back for moving head action. Granted, given Ceratopsians’ body structure a head butting action is the most logical way to go, but not the most imaginative. It’s a good thing this model features electronic sound, so there’s at least some part of its action features that sets it apart from the other Ceratopsians Kenner produced thus far. Its sounds are pretty good, and though of course nobody knows what roars Chasmosaurs produced in reality, they suit the beast. The head attack action works properly, and is easy to activate. You can put the animal on the ground, hold it by the tail and pull its leg, and it will knock any smaller figure in front of it down. The paint job is also a bit of a letdown. It’s very bland and could have used more detail. It’s speculated by palaeontologists that Ceratopsians’ plates had the most elaborate colours, either to attract mates or give warning signals (as in ‘don’t mess with me, my horns aren’t friendly’). Even though these are just guesses as to the use of the plate, the people designing this sculpt might have listened to them and give this sculpt a more interesting paint job. Playability: good enough. All four legs are poseable, though one of them will move right back since it activates the attack action (same thing applies for the head). The legs can’t move very far due to the design of the body: otherwise they would get in each other’s way. They can move far enough to make for some striking attack poses for this creature though. Keep in mind this is an electronic figure. If you want to keep it in working order you shouldn’t play very rough with it. Realism: Chasmosaurus wasn’t featured in the TLW movie, or any other JP movie for that matter. Still, the shape of the head plate clearly establish the identity of this animal. It looks pretty realistic. The horns above the eyes could be a bit on the short side though. Another thing: this animal is most definitely called Chasmosaurus, and not Chasmasaurus as is stated on the box. Overall rating: 7/10. Despite its originality it’s not as good as it could have been, thanks to the boring paint job and the predictable attack action. It’s still a good sculpt though, so worth tracking down for anyone who’s tired of the old Rexes, Raptors, or Trikes. Fortunately it’s not rare, so you shouldn’t have a problem finding one for an affordable, or even low, price.